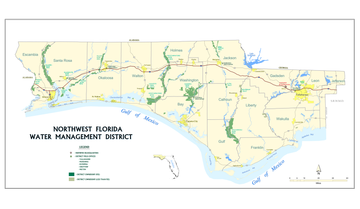 The Northwest Florida Water Management District acquires lands for flood protection, floodplain management, water quality protection, water recharge, and natural resource conservation. Management of these lands is conducted with the ultimate goal of restoring and protecting the water and natural resources of Northwest Florida, with the added benefits of providing public access, recreation, and environmental education opportunities for the residents and visitors of the region. To date, the District has acquired over 211,000 acres of land to protect and conserve water resources. Essentially all District property is open to the public for recreation, although occasionally it is necessary to temporarily close an area to ensure public safety and natural resource protection during restoration projects. Explore this section of our website to learn about the recreational opportunities available on District lands, how and why the District purchases land, and land management activities. See what recreational opportunities exist on lands owned and managed by the District, make a camping reservation, find out about hunting regulations and check our listings for property closures. The District purchases land to protect the water resources, as well as preserve and restore native Florida ecosystems. The District manages its conservation lands to maintain and protect vital water functions and natural systems, which include Florida’s unique plant and wildlife communities. The District is working with a variety of stakeholders to implement the strategies outlined in the Lands Assessment Implementation Plan. Interactive map of district lands.